1 lb. (450 gr.) Black beans. Fresh are best but most likely you'll find them dried. If beans are dried, cover with water and soak overnight. If they are fresh, just rinse them off. Drain the beans and add fresh water to an inch (2.5 cm) above the top of the beans, salt, and bring to a boil. Cover the pan and reduce heat to very low simmer until beans are soft (about 3 hours). Add 1 Tablespoon oil to a large pan and sautée the dry rice for 2 minutes over medium high flame then add half of the chopped onion, sweet pepper and cilantro and sauté another 2 minutes. Add water and bring to a boil, cover and reduce heat to simmer until rice is tender (20-35 minutes). Once the rice and beans are cooked you can refrigerate or freeze them. Keep a significant amount of the "black water" with the beans (½-1 cup 120-240 ml). This is what gives the rice its color and some of its flavor. Sautée the rice, beans reserved chopped onion, sweet pepper and cilantro together in vegetable oil for a few minutes. Sprinkle with a little fresh chopped cilantro just before serving. 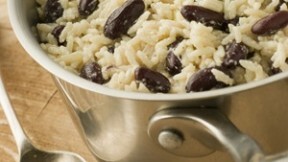 Once the rice and beans are cooked you can also refrigerate or freeze them. Make up small batches of Gallo Pinto when you want it by simply sautéing them together. A tablespoon or so of salsa Lizano is highly recommended to the beans while they're cooking.